I looked into all of this. 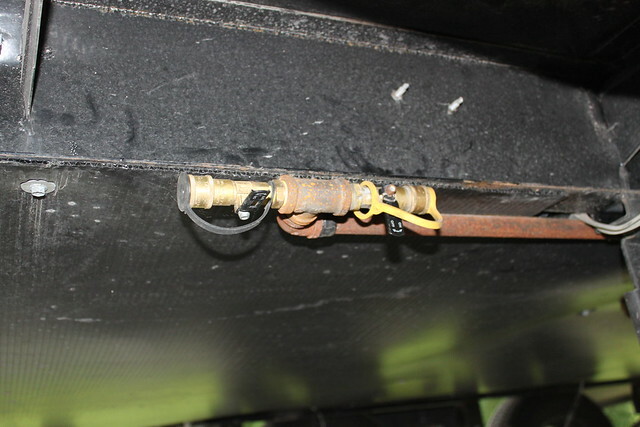 Problem is, some of the connectors you find at the RV store don't actually connect to the one that is plumbed into the RV. So you either make multiple trips to multiple stores or you end up spending way too much time on the internet searching for the correct fittings. Next you have to either buy a grill that it is easy to remove the regulator (which may not be the grill you really want) or figure out how to disable (drill or otherwise destroy) the regulator on the grill. So, to use the "nifty" good idea coupler is a PITA. That works, provided you want your grill within 12' of the propane bottle location. My propane bottles are on the road side front of the RV and the cooking facilities, water for washing dishes, etc is all on the curbside rear of the RV. So, it's either put the grill in an inconvenient location, away from the rest of the "outdoor kitchen facilities" or haul an extra bottle/unload one of the 30 pounders to place the grill where we use it. The "high pressure hose system" works for some, not for all. I tried this for my Coleman stove and it did not supply enough gas. I need to remove the regular on the Coleman or get a direct unregulated line off the tanks. Mine came with a quick disconnect fitting with shutoff valve and it's right beside the steps to the trailer. It's low pressure already so i removed my regulator and added an extension quick disconnect to my Webber and it's all good now. After reading this post, I've decided to bring my extra 30 # tank with a splitter as it's a pita to remove the regulators on my grill and Coleman stove. Not a big inconvenience. Thanks for all the information to help me make my decision. Here is what I got for my Weber Q. For my Weber Q 2200, I bought this and this. I removed the regulator on the Weber and, with a reducer/adapter, put the male QQ fitting in its place. I also bought a black iron "T" and added the female fitting to the existing gas port on the trailer. Works great and I can have the cook-top, in the outdoor kitchen and the grill hooked up at the same time. That's funny ... I just received the same item from the same vendor yesterday! Works great!